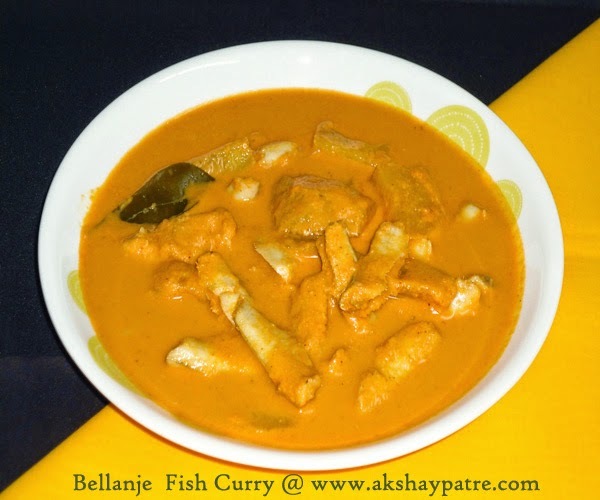 Bellanje ambat recipe - Today I would like to share a wonderful bellanje fish curry recipe which is rich with coconut based gravy. This is an authentic curry with different versions, prepared in the household of Coastal South Karnataka's Mangalore and Karwar District. 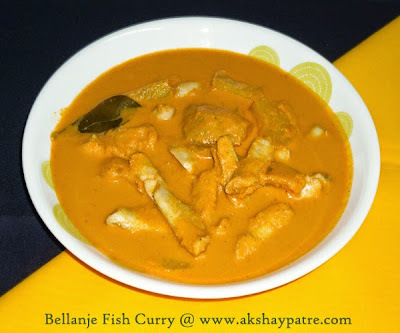 This is my all time favourite fish curry. This delectable curry is a great accompaniment to hot steamed rice, The tangy taste is induced with raw mango, but you can replace raw mango with tamarind or kokum. Bellanje, which is also known as bellanjore, is a popular fish in those parts but here it is available very rarely. It is a small variety of fish with soft bones. Fish is the good sources of proteins and vitamins. Fish are less fatty compared to meat and chicken. Clean the fish and wash them gently under running water. In the last round, rub some salt to the fish, wash nicely, then drain and keep aside. Heat little oil in a pan and fry the red chillies until aromatic. Remove and set aside. In the same pan, heat little oil and fry the coriander seeds till aromatic. Mix the coconut, red chillies, coriander seeds and onions together. Put them in a mixer and grind to a smooth paste, using water. Once the paste becomes smooth, add the ginger and garlic. Further grind it to a smooth paste. Heat the oil in a pan. Add curry leaves and chopped green chillies, saute for a minute. Add the ground masala paste, add water to make the curry consistency paste. Add salt and bring it to boil. While boiling, add the chopped mangoes and cook till the mangoes become soft. Then add the bellanje fish and boil the curry for 5 minutes or till the fish cooks well and becomes soft. Bellanje cooks very fast. Once the curry is done, remove from the flame and set aside for 5 minutes. 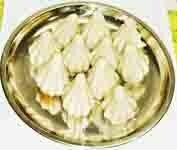 Serve the bellanje ambat hot with rice.